Reebok brings back the DMX Series 1600 that is now arriving in two new neutral color options for the early months of the year. One pair comes dressed in Grey, while the other sports a clean White motif. Both are constructed in a mix of mesh, leather and suede materials atop a DMX cushion midsole and semi-translucent outsole. 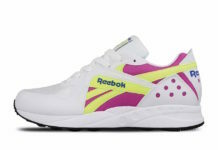 Take a look at both colorways below, and you can find these 1600s available at select retailers such as Overkill.